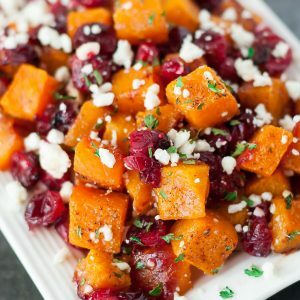 This sweet and savory side dish is perfect for the holidays and loaded with Fall flavor! Lightly drizzle or spritz a baking sheet with olive oil. Remove from oven and add a sprinkle of cinnamon (approx. 1/8-1/4 tsp depending on preference) along with feta and honey. I listed the honey measurements I used, but depending on whether you used fresh cranberries or dried, sweeten to taste. Garnish with parsley for a burst of color and dig in while it's hot! Feel free to use fresh or dried cranberries for this dish. Dried will be sweeter, while fresh with have a delightful punch of tartness to pair with the buttery squash and sweet honey. Let your tastebuds be your guide and have fun with it! Nutrition Facts are an estimate gathered using an online recipe nutrition calculator. Adjust as needed.